Type: EQUIPMENT. Detail: CHESS_BAGS. Product Code: PCSB. Plastic drawstring bag. Suitable to contain a tournament chess set. Ideal for schools or chess clubs. Chess Bag Corduroy with Zipper. 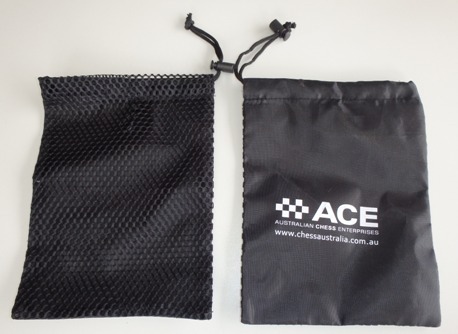 CHESS_BAGS. $6.00.